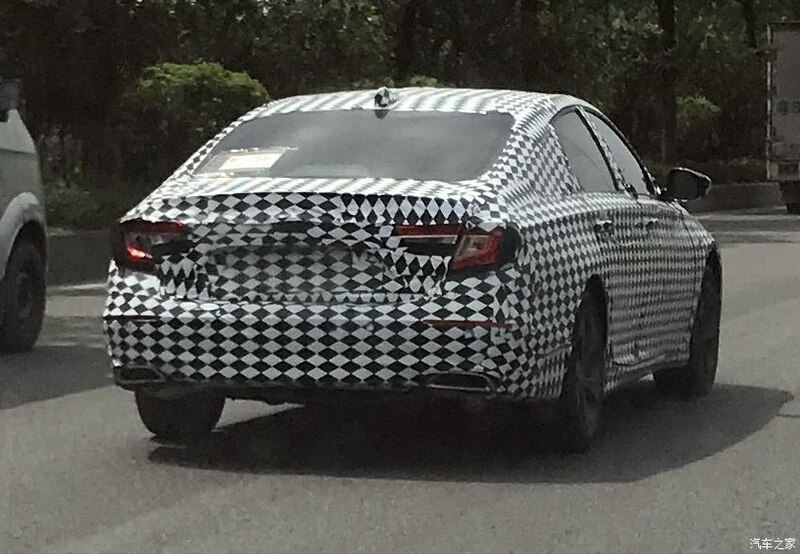 Following its world premiere in the USA in July, the 2018 Honda Accord has reached China for local testing spy shots posted by autohome.com.cn have revealed. The 2018 Honda Accord spotted in China looks nearly identical to the North American-spec version. The 2018 Honda Accord spotted in China is nearly identical to the North American-spec version. The only visible difference is the fitment of smaller wheels. The 2018 Honda Accord is 192.2 in (4881.88 mm) long, 73.3 in (1861.82 mm) wide and 57.1 in (1450.34 mm) tall. With the redesign, its length and height reduced by 0.39 in (9.91 mm) and 0.59 in (14.97 mm), but the width has increased by 0.39 inch (9.91 mm). Honda has stretched the wheelbase by 2.16 in (54.87 mm). The 2018 Honda Accord is available with three new powerplants. The base model has the 1.5-litre VTEC Turbo turbocharged four-cylinder petrol engine that produces 192 hp and 192 lb.-ft. (260.31 Nm) of torque. This engine is paired to either a 6-speed manual transmission or a continuously variable transmission. Above that, there’s the 2.0-litre VTEC Turbo turbocharged four-cylinder petrol engine good for 252 hp and 273 lb.-ft. (341.67 Nm). It is linked to either a 6-speed manual transmission or a 10-speed automatic transmission. The third powerplant option is a hybrid. The 2018 Honda Accord Hybrid has the third generation Honda iMMD two-motor hybrid powertrain. It uses a combination of a 2.0-litre petrol engine developing 143 hp and 129 lb.-ft. (174.90 Nm) of torque and an electric motor 181 hp and 232 lb.-ft. (314.55 Nm) of torque. Both sources together deliver 212 hp. Equipment highlights of the 2018 Honda Accord include LED headlights, LED fog lights, 19-inch alloy wheels, decklid spoiler, power moonroof, dual-zone automatic climate control system, driver’s seat with 12-way power adjustment and 4-way power lumbar support, front passenger’s seat with 4-way power lumbar support, head-up display, 8-inch touchscreen infotainment system with navigation, Apple CarPlay and Android Auto and 450-watt audio system with 10 speakers, including subwoofer. The full suite of Honda Sensing safety and driver-assistive technologies is standard in the new generation Honda Accord. Collision Mitigation Braking System (CMBS), Road Departure Mitigation (RDM), Forward Collision Warning (FCW) and Lane Departure Warning (LDW) are the active safety features of Honda Sensing. Driver-assistive technologies include Lane Keeping Assist System (LKAS), Adaptive Cruise Control (ACC) and Traffic Sign Recognition System (TSR). The 2018 Honda Accord is available internationally in two petrol models and a petrol-electric hybrid model. The 2018 Honda Accord goes on sale in the U.S. market this month. It’s speculated that the Chinese release will be next year.